2015 was a negative year for the oil industry as the oil price drifted around US$50 per barrel. There were many of us who, one year ago, believed that the price would begin to rise and reach $70 or more per barrel during the autumn. One can only state now that demand was obviously lower than expected and most commentators attribute that to the slowdown in the Chinese economy. Regarding fracking and oil production in the USA we saw production increase until April when it reached 9.58 Mb/d and thereafter it levelled off and fell a little. The number of rigs drilling new wells has declined markedly. During 2014 the average rate of oil production in the USA was 8.7 Mb/d while during 2015 it was a little under 9.3 Mb/d. OPEC nations have not reduced their oil production quotas so this, together with the dampened demand for oil, has caused the low price. We now see that many small oil companies in the USA are having difficulties. 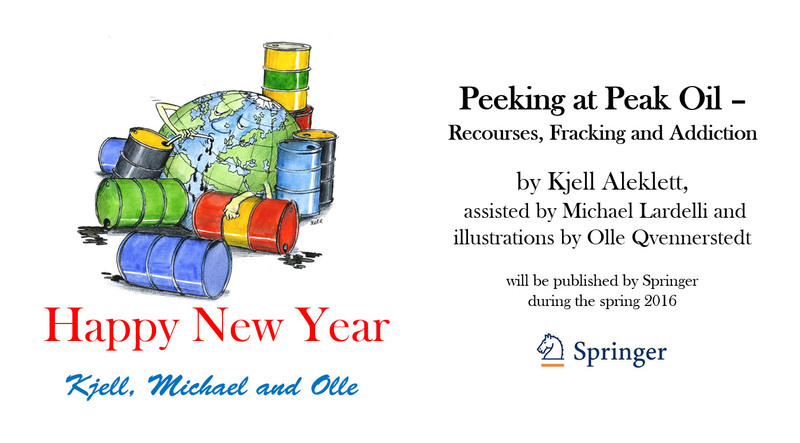 The question is whether 2014’s USA oil production boom will ever return. The low oil price has also caused economic problems for the Norwegian national oil company Statoil and, presumably, it will be forced to make thousands of employees redundant. The treaty in Paris was positive news for the climate with the goal that, by 2100, the increase in temperature will not exceed +2 C. In reality this means that oil production will follow the Peak Oil scenarios that we have worked with over the last 10 years. If the price of oil continues to be low we will soon see a decline in global oil production. Future possible temperature increases are described in four scenarios named RCP2.6, RCP4.5, RCP6.0 and RCP8.5. Temperature changes related to the various scenarios are described in the figure below. The terror-scenario is RCP8.5. It is this scenario that can cause a temperature increase by up to +4.5 C.
I have just analysed RCP8.5 as it is described in the publication “RCP 8.5 – A scenario of comparatively high greenhouse gas emissions”. That paper states that the energy needs for the scenario are covered primarily by fossil fuel use which is also shown by the figure below. Here are parts of my analysis: In 2100 production of oil, coal and gas is ongoing and this production requires that producible reserves of these fossil fuels exist in 2100. Various studies show that annual production of fossil fuels cannot exceed 5% of reserves. In order to compare reserves of different forms of fossil fuels we can use the common energy unit gigabarrels of oil equivalent (Gboe). To produce 27 Gboe of oil in 2100 requires oil reserves of at least 540 Gboe. Reserves of coal and natural gas to satisfy the requirements for their rates of production in 2100 must be 2,620 and 770 Gboe respectively. From 2015 until 2100 the scenario requires at least 4,070 Gboe of oil; 6,630 Gboe of coal and 3,670 Gboe of natural gas. If the required reserves for 2100 are added to the consumption until 2100 then the accessible reserves required for the RCP8.5 scenario to be possible are 4,610 Gboe of oil, 9,250 Gboe of coal and 4,440 Gboe of natural gas. According to the BP Statistical Review of World Energy the accessible global fossil fuel reserves are 1,700 Gboe of oil; 3,400 Gboe of coal; and 1,172 Gboe of natural gas. The conclusion is that the RCP8.5 scenario requires 170% more oil, 170% more coal and 280% more natural gas than the existing, reported reserves. And so the happy New Year message is that scenario RCP8.5 can never occur. The fossil fuel reserves it requires to be burned do not exist. RCP6.0 can give a temperature increase of up to +3 C; RCP4.5 to +2.5 C and RCP2.6 to nearly +2 C. It is emissions according to RCP2.6 that are the goal of the Paris treaty. These scenarios and the entire climate problem will be analysed in more detail in my new book, “A world addicted to oil” that will be ready (in Swedish) at the start of 2016 and the English version later in the spring. I am glad that I waited until after COP21 to finish the book.